Yamaha YDP 162 Review - why this piano is awesome? In our Yamaha YDP162 Review, we are exploring the top features of this beautiful digital piano which combines beauty and functionality. It plays beautifully. You will notice the realistic feel of this piano as soon as you sit in front of it. This comes at a cost. It is more expensive than many other digital pianos on the market. Does the YDP162 live up to expectation? The brand Yamaha is known all over the world for their digital pianos as well as a huge range of audio equipment and instruments. You can rest assured that your piano is very high in quality if you opt for a modern Yamaha model. Let’s start at the most important feature; the sound. If you plan to spend this kind of money on a digital piano, one which sounds synthesized or low quality is not desirable. Fortunately, the YDP162 sounds exceptional, with a sound system built around the CFIIIS concert grand piano, also made by Yamaha. This piano has been sampled to create the CF sample set that is present in most of the modern Yamaha digital pianos such as the YDP 143 model. Yamaha have combined great sound with 128 note polyphony so you can play even complicated melodies without dropping notes. This has an acoustic optimizing feature. The way the acoustics are amplified from the piano is improved as a result. A graph of the frequency response and the way this alters the resonance while playing is available on Yamaha’s website. Listening to the piano itself is the best way to understand how this works. This function provides a more expressive experience when you are playing and the sound is richer as a result. Your playing experience is vital. Yamaha has included features with this in mind. A realistic feel on the keyboard itself makes it seem like you are playing an acoustic piano. The materials used replicate ebony and ivory and this helps with grip and improves the feel on your fingers. The ‘action’ of a piano is vital. This piano replicates the feel of an acoustic piano as well as most of its competitors. The Yamaha YDP 162 uses a Graded Hammer action which is designed to create the same resistant feel that the mini hammers on a grand piano would give. It feels very similar to playing an acoustic model. The YDP 162 is taller than its predecessors. 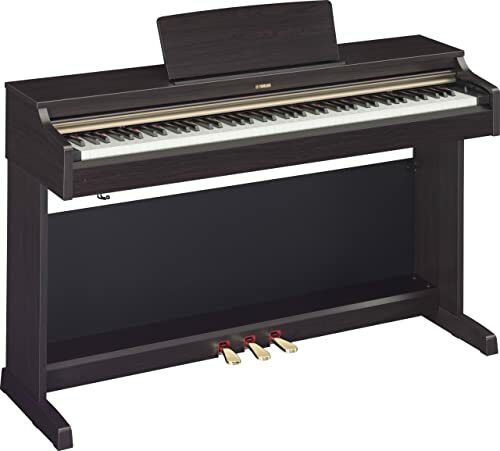 It has a 33-inch height which provides an upright piano look. On top of this, it allows the sound to be naturally richer and deeper. 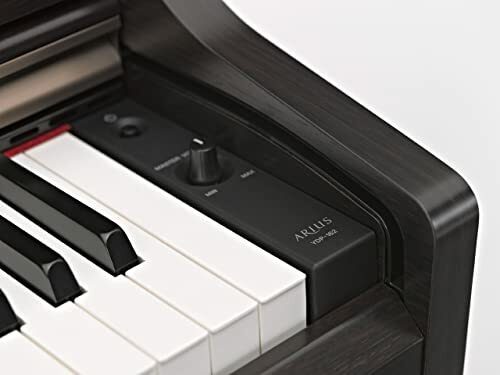 There is a touch sensitivity setting within this digital piano. This is something that not a huge amount of digital pianos offer. You can choose between Hard, Medium, Soft and Fixed options on the piano, so you can opt for one which suits your playing style. If you find that you hit the keys hard you can adjust accordingly in order to give a more expressive style. It is important that the speakers included allow you to hear the rich sounds of the piano properly. If you are playing gigs regularly then you will probably be plugging into PA systems and other speakers. At home, your inbuilt speakers will be the way you hear your playing. Do the Yamaha YDP162 speakers live up to expectation? In terms of speaker power, the 20 Watt amp which is inbuilt is more than enough for playing solo at home or even playing with others in an acoustic band practice. Gigs will need more amplification. 20W is more powerful than many of the competing pianos, many of which have 12-14 Watt systems. The audio clarity is good quality, too, with plenty of clarity and not much chance of any interference or distortion. You can plug headphones in for solo practice if you so wish, this means you won’t annoy the neighbors! This piano lets you record your playing, and even record multiple layers on the two track recording interface. You can layer a melody with chords or even two different sounds. There are 10 sounds in total to choose from. You might think that isn’t many. There are digital pianos with more options for sounds, but Yamaha has focussed on the quality of the sounds rather than quantity. There are still some great options. The grand piano is combined with harpsichord, multiple organs, strings and a vibraphone. The three standard piano pedals are inbuilt, so you can further alter the character of the sound. These pedals help the Yamaha to sound and feel like an acoustic model. Effects are also inbuilt, you can control the reverb, resonance and of course control the Intelligent Acoustic Control feature. USB to host capabilities mean you can plug this into a computer. This will allow you to record into your favorite software with ease, or even control virtual instruments. Features for learning piano are also a good addition to any digital piano. The Yamaha YDP series doesn’t disappoint in this regard. 50 songs are built-in to this piano, and you can play them as demos or follow the included book “50 Greats for the Piano”. If you are a beginner, this might be invaluable on your journey to learn to play. The YDP 162 is not a piano which is particularly portable, it is heavy and is suitable mainly for playing at home, unless you are touring with a full crew and a truck! If you want a model to sit in a room of your home and allow for a realistic feel without the hassle of tuning or other issues which go along with acoustic pianos, this model might be a good choice for you. It combines very good quality samples with a lovely feel and plenty of tech features so you can do more with your piano. It is compatible with computers, effects and other accessories. If you can afford the hefty price tag, the features we’ve shown in the Yamaha YDP162 Review can certainly justify the price.